J. Emery Barker is a shareholder with extensive experience in litigation in the areas of real estate, probate and trust, commercial banking, securities, insurance defense, and general civil litigation. He has argued appeals in the Arizona Courts and the Ninth Circuit Court of Appeals. In addition, his diverse practice encompasses estate planning and probate, and securities arbitrations before the Financial Industry Regulatory Authority and the New York Stock Exchange. Emery was raised in Phoenix, where his grandfather homesteaded land in the early 1900s. He received his J.D. from the University of Arizona, and was admitted to practice law in 1960. He serves as a Judge Pro Tempore in Pima County Superior Court and has served as Judge Pro Tempore for Division One of the Arizona Court of Appeals. Emery completed the Masters Forum at the Straus Institute for Dispute Resolution at Pepperdine University. He has served as an arbitrator for the American Arbitration Association’s construction industry and commercial panels, and the U.S. District Court in Tucson. He is a member of the American Board of Trial Advocates. His concern for the law extends to guarding its professionalism. He served for seven years on the State Bar Committee on Rules of Professional Conduct, and seven years as a hearing officer in lawyer disciplinary matters. Emery has presented seminars to attorneys on the subject of professionalism and has served as a State Bar appointee to the Arizona Judicial Qualifications Commission, which oversees the conduct and discipline of the judges in Arizona, and reports directly to the Supreme Court. 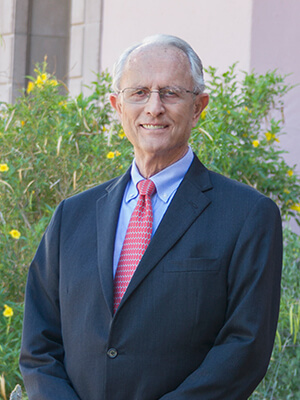 He has served as President of the Pima County Bar Association and the Pima County Legal Aid Society, and has served on commissions appointed to study and advise the Legislature on medical malpractice, healthcare laws, the housing and treatment of prisoners, and legal services to the poor. Early experience shaped his community interests. In the mid 1940s, he was awarded a day campership at the Phoenix YMCA. The donor was a young constable who later became Arizona Governor Wesley Bolin. Over the years, Emery has worked to repay the benefits of this gift and is a past president and an Honorary Life Member of the Metropolitan (Tucson) YMCA. He has been a leader and organizer of many other youth-oriented activities for schools and sports, is a member of the Rotary Club of Tucson, and a Trustee of the Franklin Auto Museum.